← How is Jesus Significant to Us? To whom does Jesus make this invitation? It is to everyone. ‘Come to me, ALL you who are weary and burdened’—unless, I suppose, one is not weary or burdened. There are no preconditions. There is no creed or doctrinal statement mentioned. There is no screening out of certain types of people. There is not even a sinner’s prayer. Once we accept Jesus’ invitation, we will begin to learn of him, and he does tell us important things that affect our lives, but they are not onerous requirements. This is no trick. We will not discover that accepting Jesus’ invitation ultimately involves lists of rules or demands. We will not have to accept beliefs that are contrary to our own reason. In fact, there are no belief requirements at all—only rest from weariness and burdens, and learning from Jesus. Jesus promises to relieve our burdens, not to increase them. Much of the problem with traditional Christianity is the burden it puts on its members—from requirements of specific behavior to requirements of doctrinal creeds. These are all baggage; they are not the requirements of Jesus. Consider Jesus’ invitation. We explore the wonderful ramifications of this invitation on this blog. Do you find Jesus’ invitation appealing? I do. Next time, we will look at the Father’s family. Who among us is part of that family and who is not? Please join us. This entry was posted in Jesus, legalism, the Good News, the invitation and tagged I will give you rest, John 3:16, Matthew 11. Bookmark the permalink. Takes an open mind to even consider these concepts. I’m sure many will call you a heretic. Keep being willing to put your ideas out there for consideration. Thanks for the encouragement! I am sure you are correct about the name-calling. This is the first time I have read your blog. I have not taken the time to read it extensively, but a few things have really caught my eye. I accepted Christ as a young child, and have always felt The Father’s presence in my life. As a child, I was FILLED with fear. I tried to control my fear with ‘rules’ I would make up in my head. Later, (in college) I began to use alcohol (I called it partying) to self-medicate my anxiety. This (the anxiety part of it) has recently come to the surface (a husband and 4 children later) with an Anxiety Disorder diagnosis that I have probably had my entire life without really knowing it. My first step was to recognize my alcohol use as a sin and to ask God, through Jesus’ sacrifice on the cross, to forgive me for my choices. Not only has The Father forgiven me, he is beginning to heal me. Through medication, Christian therapy, and His revelation, I am slowly being healed. I can’t wait to get to a place where I can use this testimony to bring others good and Him glory. I came across your blog by searching for “when your faith becomes like a superstition.” For a good long while, I was ‘trying’ to fill with His Spirit. To fill with His Word, To pray without ceasing, but still the anxiety (or the battles in the mind) would not cease. It was not until I surrendered completely to His will that the changes began. And the changes were nothing like what I expected them to look like (hence I know it is only because of Him – nothing I could do on my own – that is bringing healing.) I was just curious about faith becoming a superstition? I think that happens a lot to “Christians.” When you peel it all back, it must always come down to Jesus. It’s just sad when the baggage gets in the way. Thank you for following Jesus and sharing your experiences. Jennifer, welcome to the blog! I am glad that you found the blog and hope you come back to read more. It is so good that you are doing better in working through the baggage. Helping people with that is what my whole blog is about. Let me know if there is anything I can do to help. I am also interested in additional questions or comments you may have. Have a great day! Tony, I am so pleased that find so much to relate to, and I am glad you are becoming so comfortable in your big transition. Here is a selected post from my first year which you have probably never seen. It is freshly revised and updated. I hope you like it! Jesus accuses the Pharisees of putting burdens on people. A millstone around our necks. This is the carrot and stick religion of rewards and punishments, heaven and hell. It sounds all too familiar. I’m new to this page, somehow I got burned by IBF church as well as taking up Calvinism, in the end, I turned my back on Jesus even went so far as to practice sorcery and witchcraft and demonology for which I regret however now I feel that there is no way back to Jesus, I have tried desperately to call out to him with no avail. what hope do I have? Andrew, it sounds as though you have really had a bad experience. But there is always a way back to Jesus. In fact, I am sure that Jesus has been with you the entire time. You have called out to him, but why do you think it is to no avail? 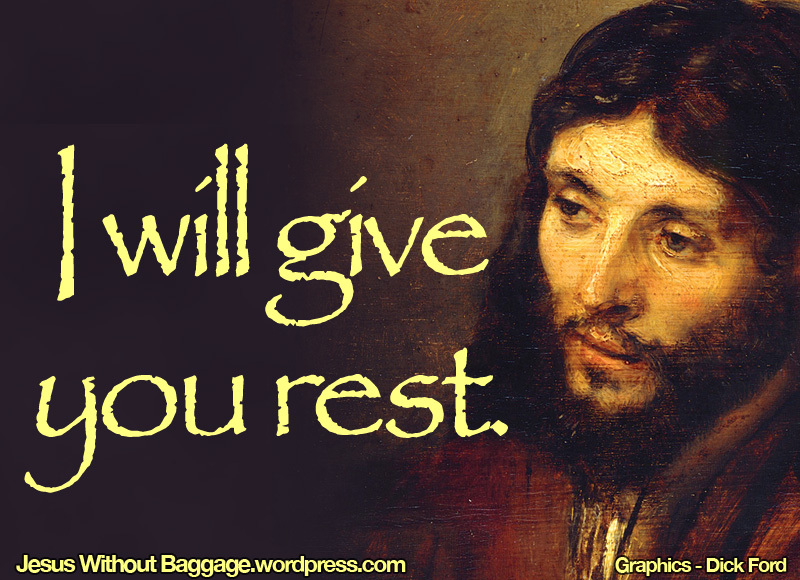 As pointed out in this passage, Jesus invites us to come and receive rest from him; he is not stingy about it nor does he make it difficult to you. He welcomes you! Is there anything specific that I, perhaps, can help you with?